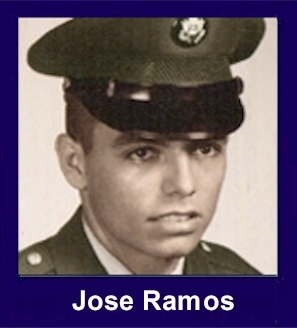 The 35th Infantry Regiment Association salutes our fallen brother, SP4 Jose Ramos Jr., who died in the service of his country on November 27th, 1967 in Quang Nam Province, Vietnam. The cause of death was listed as Small Arms/AW. At the time of his death Jose was 20 years of age. He was from Corpus Christi, Texas. Jose is honored on the Vietnam Veterans Memorial at Panel 30E, Line 99. The decorations earned by SP4 Jose Ramos Jr. include: the Combat Infantryman Badge, the Bronze Star with V, the Purple Heart, the National Defense Service Medal, the Vietnam Service Medal, the Vietnam Campaign Medal and the Vietnam Cross of Gallantry with Palm Unit Citation. Jose is buried in the Rose Hill Memorial Park, Corpus Christi, TX. For heroism in connection with military operations against a hostile force in the Republic of Vietnam. Specialist Four Ramos distinguished himself by valorous actions while serving with A, 1/35th Infantry. On 27 November 1967, Company A was moving across open rice paddies when it was engaged by an enemy force using recoilless rifles, mortars, and automatic weapons. The company immediately began to engage the enemy but one machine gun was positioned so that the company could not neutralize its effectiveness. As it sprayed intense and accurate fire, Specialist Four Ramos with complete disregard for his own safety, charged forward and eliminated the enemy position, enabling his company to maneuver. However, in doing so, he sustained a mortal wound. His timely actions saved many lives and gave his unit the impetus to neutralize the remainder of the enemy forces. His initiative, aggressiveness, and self-sacrificing devotion to duty are in keeping with the highest traditions of the military service and reflect great credit upon himself, his unit, and the United States Army.